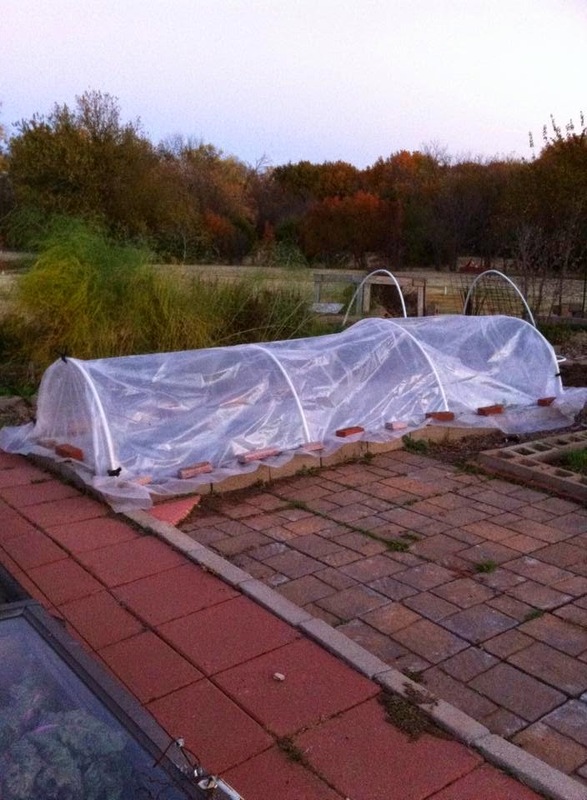 I've shared quite a bit about our "hoop houses". These are also called "High Tunnels". Hoop House makes more sense to me. So, I call them "hoophouses", for short. Here's a picture or ours. The larger one in the background is made of large metal ribs that are set in concrete. The smaller one in the foreground is made of fencing panels that are bent into arcs and fastened to a 2X4 frame. We grow cool season crops, such as spinach, kale and lettuce in these. Last fall, I decided to create a mini-hoophouse over one of the raised beds where I had Swiss Chard, Parsley and Cilantro growing. I wanted to see if I could keep these alive over the winter. Here's a picture of it from last fall. The plastic is draped over PVC pipe that is bent to form arches and secured to metal rebar pieces that are driven into the ground. We had some pretty cold weather during January with temperatures down in the teens several nights and even in the single digits a couple of times. I'm happy to say that my little hoophouse has performed nicely. Recently, I uncovered it for a while and things looked pretty good. But other than this, the plants under there looked good. This mini-hoophouse is a simple and inexpensive way for home gardeners to keep their garden going and enjoy fresh greens all winter. It is certainly worth the trouble. Give it a try! We took a short vacation a couple of weeks ago. We were gone a week during which we visited friends in south Texas. These are friends who spend the winter near McAllen, Texas. They have a small travel trailer parked in a large mobile home park that caters specifically to senior adults. There are daily activities covering all areas of interest ... card games, pool tournaments, bicycling, quilting classes, water exercise. You name it, they've got it. We spent two days there and had a blast! And, of course, we had to go shopping for souvenirs. I didn't want something that would just sit around and gather dust. So, I ended up buying, what else, but a chicken! A chicken flower pot, that is. Isn't she beautiful! I was excited to get her home and introduce her to our other girls. I was sure they would love her. I set her on the ground in their pen and here's what happened. They wouldn't go near her. I even put lettuce leaves all around her and they still wouldn't venture close. They love lettuce and normally I have to fight them off when I go in the pen with lettuce. But, nope, they weren't going to have anything to do with it as long as the brightly colored intruder was there. So, for now my new chicken is gracing my covered porch where she keeps me company when it is warm enough to sit out there with my morning coffee. This summer she will be filled with petunias or other bright flowers. She may not be alive, but she sure is pretty. Last summer I was overrun with tomatoes and ended up freezing a bunch of them. I also made Spaghetti Sauce with some of them in which I used basil and oregano that I grew in my herb garden and dried myself. Here is a blog entry I wrote about that. Recently, I found a recipe for "Italian Seasoning" that works nicely in the Spaghetti Sauce above. It is very simple. Just mix the ingredients together and store in an air-tight container. I use old spice jars that I have saved. All of the herbs used in the recipe are easy to grow and you can dry them easily by simply laying them on paper towels on your kitchen counter for a few days. My preference in kitchen scissors has evolved over time. Here is a picture of the ones I currently own. I've had the orange-handled pair on the left and the pair next to them for several years. It was nice to have two pairs in case one pair got misplaced (which happens often!). When we started our farmers' market business, I ended in charge of the herb garden and needed a good pair of scissors to use for cutting herbs. I started out using the orange pair, but found they got gummy and dirty quickly. In order to clean them, they had to be taken apart. This was a pain in the patootie for it involved getting a screwdriver to loosen the bolt that held them together. The black pair was no better. The problem was solved when I found the third pair from the left. When turned over, you'll see they are held together by a small piece of metal on one side that fits into a rectangular hole on the other side. When opened up all the way, the metal piece will slip through the hole and they come apart. This makes for easy cleaning. I use this pair for heavy duty work, like cutting thick basil stems, where I gather several stalks together and cut them all at one time. It goes faster that way. I liked this pair so well that I bought a pair of real "herb" scissors (the shorter green-handled pair on the right) for lighter work. They come apart in the same manner. Believe it or not, I use all 4 pair for various chores. I've decided you can never have enough scissors! 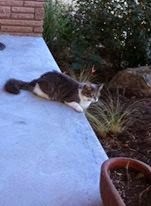 About two years ago, I wrote about a little stray cat who came to our house. We started feeding her, named her Misty and adopted her as our own. Our own, that is, if anyone can "own" a cat. She is quite the independent little soul. My how time flies! Today, that little cat has grown into a beautiful lady who has captivated us with her personality. She usually spends the day outside, especially in nice weather. Here she is last summer lounging on the front walk. In the summer, I frequently find her in the garden laying under the basil plants in the shade. She occasionally jumps into the chicken pen on her way to the shed where we store t-posts, tomato cages and other farm items. The chickens ignore her and she ignores them. She prowls around in the shed looking for mice. 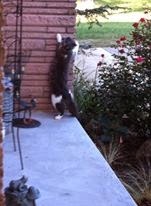 She's not the best mouser in the world (probably too well fed for that), but that doesn't keep her from practicing. She likes to stalk and chase "invisible" mice. These antics crack me up. 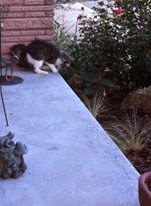 Here she was on the front porch earlier this year stalking an invisible mouse. She was quite wary of Sally (the dog) when she first came here, but they have since developed somewhat of an alliance, even eating in close proximity at times. And, more recently, sleeping together on the "dog" pillow. If you have followed this blog, you know that Sally is crippled from a bullet wound she received before she came to us. (Sally's Story) Anyway, as a result of her injury, she doesn't spend a lot of time outside, chasing squirrels, etc. However, once or twice a day she goes out and makes her "rounds" of the farm. More often than not, you'll see the cat following along behind her on these outings. This is funny because Sally seems blissfully unaware that she is being tailed. Misty has carved out a little kingdom for herself on our 5 acre farm. That's about all the room she needs to be Mistress of the Manor.